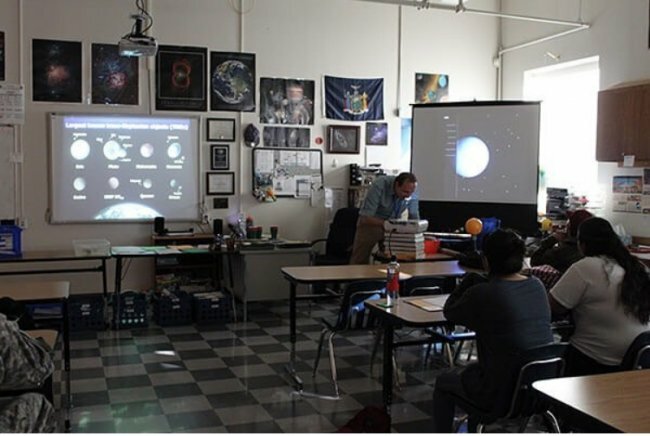 A tour of the solar system commences as pictures of Neptune, Uranus and other planets flash across the screen in Brandon’s Earth Science class. These pictures spark conversation and, as the discussion forms about the possibility of infinite worlds and existence of life outside of Earth, students look fascinated and eager to learn more. Brandon continues by explaining that, as we make advances in technology, we will understand more about our solar system. However, in order to help his students learn more about the concepts discussed in this astronomy unit, they’re going old school and playing a game of Pictionary. Brandon feels it is important for his students to not just memorize the vocabulary associated with this unit, but to understand and solidify it in their minds. And what better way to do this than with a fun game and a little competition? As the game dictates, the class divides into two teams and, with dry erase markers in hand, they race to get through as many terms as possible. As each team guesses an answer correctly, a point is added to their score until the buzzer sounds and the game is over. The winners receive their Jolly Rancher prize and walk away as more knowledgeable than before.